from injury, trauma, or previous shoulder surgery. How common is frozen shoulder syndrome? Frozen shoulder syndrome is not common among young people. 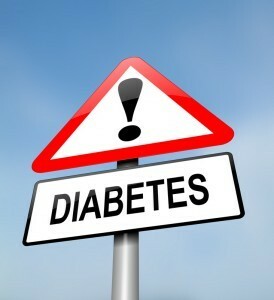 However, it is usually found in the 40+ age group, affecting 3% of the general population. Women have a slightly higher incidence of frozen shoulder syndrome, and it is 5 times more prevalent among diabetics. The increased prevalence among diabetics is due to glucose molecules that stick to the collagen fibers in the joint capsule. This leads to stiffness and decreased range of motion. Hormone changes also contribute to the condition, which is why it is more common among women. 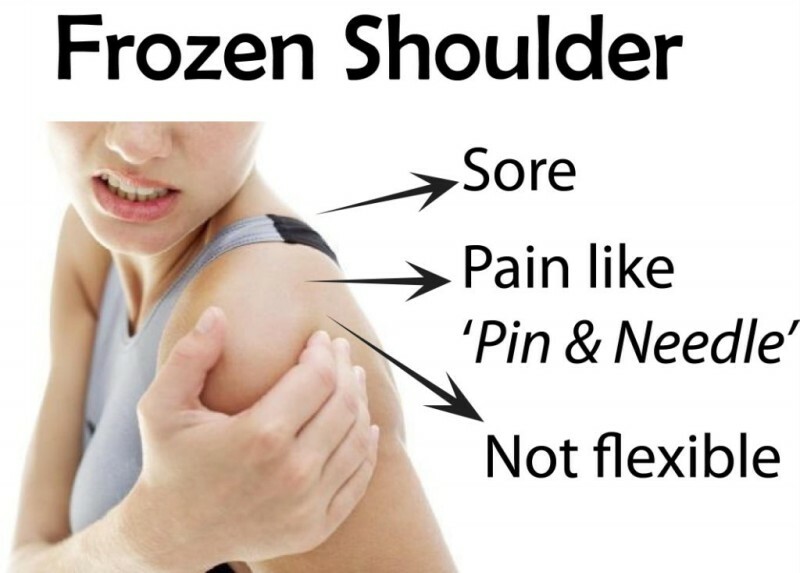 What are the phases of frozen shoulder syndrome? Freezing phase – Where the joint tightens up. Stiff phase – Where the movement in the shoulder is somewhat reduced. Thawing phase – Where pain gradually lessens and mobility increases. Who is at risk for frozen shoulder syndrome? What are the symptoms of frozen shoulder syndrome? 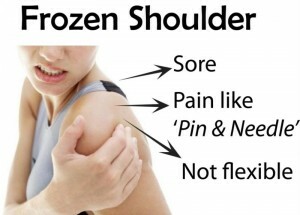 Frozen shoulder begins with mild pain, which makes arm and shoulder movement difficult. The decreased shoulder activity leads to stiffness and less motion. Over time, you cannot do usual movements, such as reaching behind you or over your head. What exams and tests are used to assess for frozen shoulder? The doctor will first ask you questions about your symptoms. After examining your shoulder, he may want to take some x-rays. This is done to check for arthritis and other conditions that affect the joints. An MRI test may be used to assess for inflammation and ligament tears. How is frozen shoulder syndrome treated? The pain is treated using nonsteroidal anti-inflammatory medications (NSAIDs). Steroid injections are often used to reduce swelling and alleviate pain. Physical therapy is used to improve range of motion and strengthen the shoulder joint. Because it takes weeks to see progress, a complete recovery with intense physical therapy may take 6-9 months. If frozen shoulder is left untreated, the condition may get better by itself. Will I need surgery for frozen shoulder syndrome? Surgery is only recommended if nonsurgical treatment does not work. The shoulder arthroscopy procedure is done under general anesthesia, so you will be asleep and feel no pain. During surgery, the scar tissue is released, and the shoulder goes through full range of motion. After the procedure, you may receive pain shots (injections) so you can undergo physical therapy and improve movement. What is the prognosis for frozen shoulder syndrome? Arthroscopic surgery is used to cut and loosen tight ligaments and to remove the scar tissue from the shoulder capsule. After surgery, physical therapy takes 1-3 months to prevent the scar tissue from forming and frozen shoulder from returning. Possible complications include pain and stiffness. At Phoenix Shoulder and Knee, Dr. Adam Farber is a Board Certified orthopedic surgeon specializing in all types of hip, shoulder, knee and elbow conditions. He has had extensive success with frozen shoulder treatment, so call us today to start treatment! Getz CL, Phillips J. Adhesive capsulitis. In: Skirven TM, Osterman AL, Fedorczyk JM, Adadio PC. Rehabilitation of the Hand and Upper Extremity. 6th ed. Philadelphia, PA: Elsevier Mosby; 2011:chap 89.